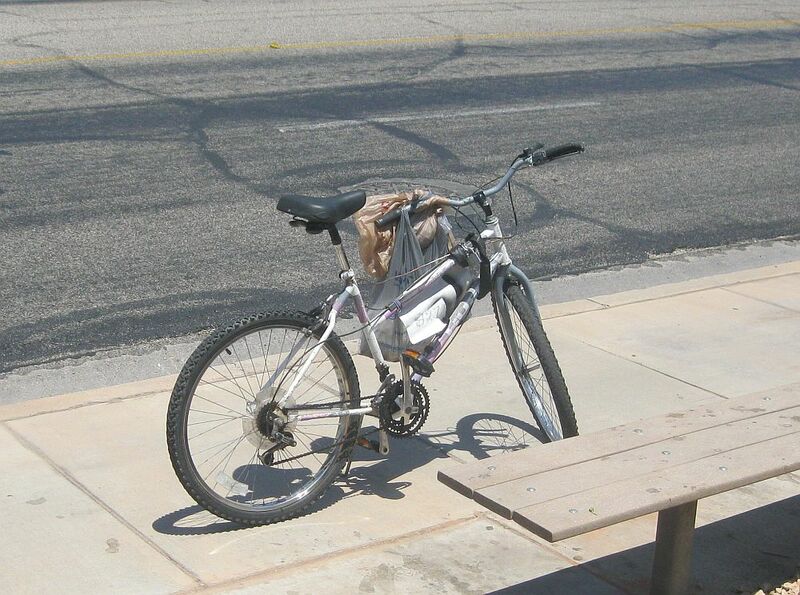 ST. GEORGE — A bicyclist escaped serious injury Wednesday afternoon but was cited by police officers after he crossed in front of a car that was exiting a parking lot and was bumped by the car. St. George Police Officer Tyrell Bangerter said the driver of the car was exiting the parking lot of Honolulu Grill, located at 706 E. 700 South in St. George, at about 1:15 p.m. The driver of the car stopped and then pulled forward, partially blocking the sidewalk. 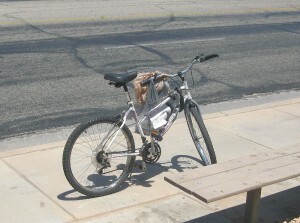 A bicyclist traveling west on the sidewalk swerved out in front of the car. The bicyclist did not make eye contact with the driver, Bangerter said, and it was at that moment the driver decided to go. Bangerter said the car hit the bicycle, resulting in minor damage to the bicycle and the car. No injuries were reported. St. George Police Sgt. Craig Harding was also on scene. The bicyclist was cited for failure to yield. Good. Sick of bicyclists think they own the road and don’t follow basic right of way rules. Um, in this incident the bike was riding on the sidewalk. He was not trying to “own” the road. He is suppose to be on the road, not the sidewalk. Funny, sounds like most of the drivers in St George. I’d never ride a bike in this town. You still have to yield the right of way to other vehicles and pedestrians. The bike deserved the ticket, I hope he didn’t scratch the poor victim’s car. Sidewalk riding is generally much less safe than riding in the street, especially when riding against traffic flow. Some cyclists ride there because they’re admonished to do so by drivers. Regardless, when we drive our motor vehicles, we have a legal and ethical responsibility to watch for others. 41-6a-1105. Operation of bicycle or moped on and use of roadway — Duties, prohibitions. (vii) a lane that is too narrow for a bicycle and a vehicle to travel safely side by side within the lane. Show me in you code citation that a bike can ride on the sidewalk against the flow of traffic, zip in and out and between cars, cut infront of a car trying to turn onto the street from a driveway and not yield to anyone without some type of liability. Where is the cyclist’s “legal and moral” responsibility. Cyclists ride on the sidewalk because they’re “admonished” to do so by drivers? @42214, that’s a pretty convoluted request. If you are on the side of law-abiding behavior and respect for others, I’m on your side. I teach cycling courses in which i demonstrate how much better off we all are when we follow the rules of the road and treat one another with respect. My online courses are used by courts like Defensive Driving courses, to educate cyclists who have been ticketed for sidewalk riding where illegal, riding against traffic, running stop signs and stop lights, and more. I’m working hard to make the transportation mix a better one for all of us. We all have a legal and moral obligation to operate with care, whether we are walking, riding a bike or driving a car. And yes, many cyclists ride on the sidewalk because they are buzzed or honked at by drivers, or have things thrown at them. Having police officers tell people riding bikes that they are required to ride to the “extreme right side of the roadway” when that is not what the law says (and is more dangerous for riders and drivers) helps no one. I thought my question was pretty straight forward. Section 1106 speaks of negligent collision and yielding right of way. Here is a “simple” question to an expert on bike laws. If title 41 requires all bikes to obey basic traffic laws , what happens if you have a club riding single file 12″ tire to tire and a bike goes down causing a chain reaction crash of 20 bikes or so. Does each cyclist get cited for 41-6a-711, following too close. The laws can vary considerably from state to state, but from looking at the Utah code and the relevant definitions, that would seem to be the case for all but the lead rider. The laws are written by people, resulting in gaps and in situations not fully considered (hence the reason for the Court system). There are also gaps and errors in enforcement. For example, even in states where the law requires that drivers pass ‘vulnerable road users’ with at least three feet of space, seldom are drivers who strike and kill law-abiding riders, pedestrians or roadside workers cited, despite the fact that the collision is prima facie evidence of an infraction. It’s easy to get caught up in pointing fingers, but the fact is that there are errors made by members of all groups of road users (I hold anyone taking my cycling courses to a *very* high standard). The litmus test is how we as individuals would treat others if there were no laws. If our primary consideration is our own convenience or haste over the safety of others (or the desire to point out their errors while we ignore our own), we need to seriously rethink our approach. Truce. I probably agree with you on most if not all your points. I merely feel too many cyclists ride irresponsably through traffic and parking lots etc and it’s refreshing to finally see one held accountable.